This manual we will explain how to establish the communication between LUCI Live software running on a mobile device and the Prodys ProntoNet hardware codec. The mobile device is connected to the internet via a 4G connection and our studio (ProntoNet) is connected to the internet via our local router. To be able to establish this communication we will need to set up the different devices: LUCI Live will have to know where to send to, the router will need to know where to transfer the communication coming from LUCI Live and the ProntoNet will need to accept this communication. You’ll need to choose which IP address is the destination for this port’s requests. This is the local IP address of the Prodys (example 192.168.1.100). Lastly, you’ll be able to choose which port the request should be targeted to on the destination IP (same as the incoming port 5010). 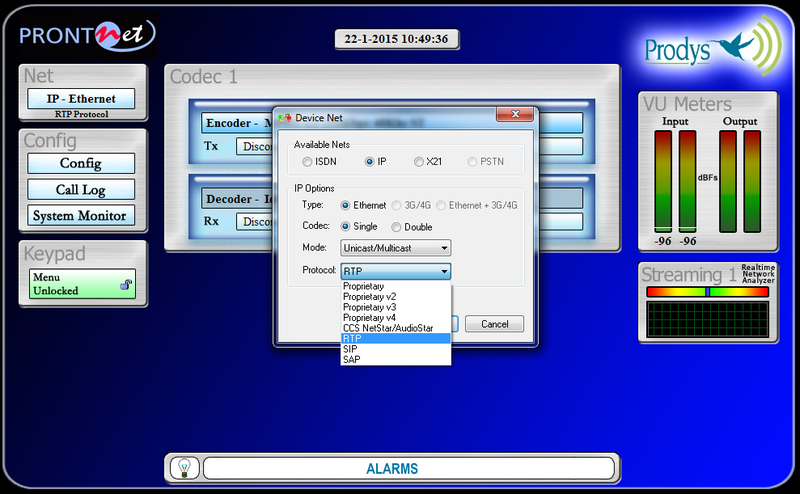 You can set up the ProntoNet via the hardware user interface, but for this manual we will use the web interface. The ProntoNet web interface is supported only by the Internet Explorer, make sure you activate the local IP address of the ProntoNet in the compatibility settings of the Internet Explorer. To access the web interface fill in the IP address of the ProntoNet in the menu bar and hit enter. And click “Control”. Now you accessed the ProntoNet, you have to configure it for communication. 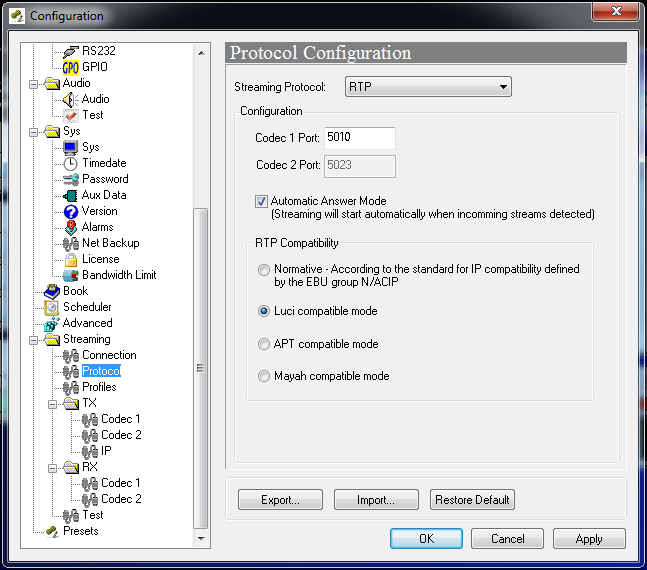 Hit the “IP-Ethernet” button in the upper left area, choose the RTP protocol and click OK.
Click the “Config” button and choose IP in the left interface tree. 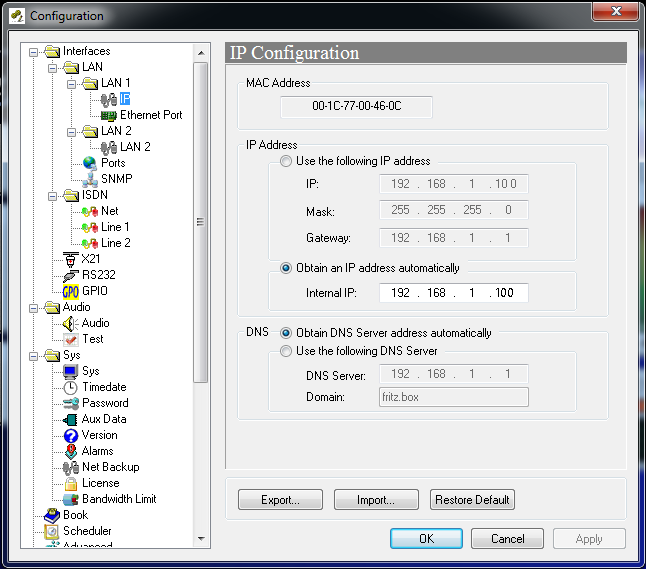 Make sure the “Obtain an IP address automatically” and “Obtain DNS Server address automatically” options are activated. Then click the Apply button. Scroll down to the Protocol configuration. The Streaming protocol should be automatically set on RTP. Choose the “Luci compatible mode” option. 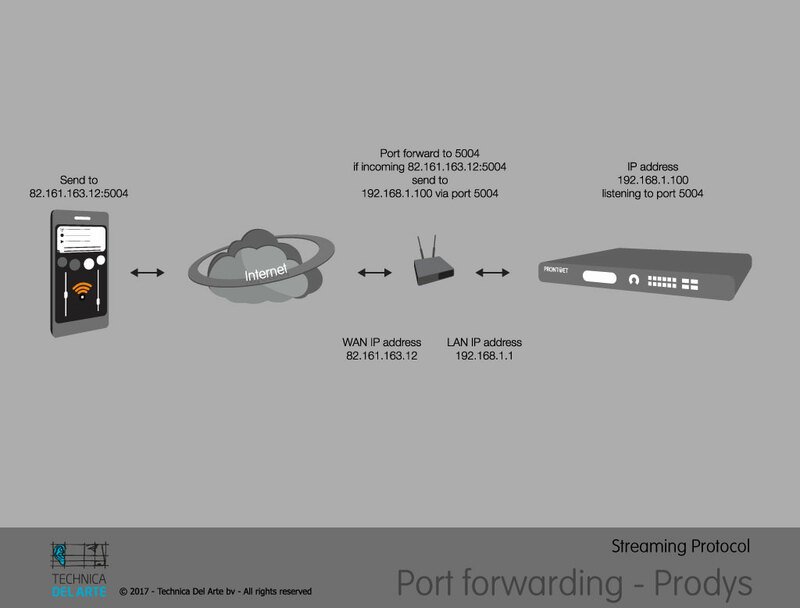 The “Codec 1 Port:” number is important for the port forwarding configuration. Make sure you choose the right port number you already set in the router. For this example the port number is 5010. Click the “Apply” button and you are ready to stream.